You are here: Home / Jewelry / Sneak favorite: Edwardian cabochon sapphire and diamond ring. 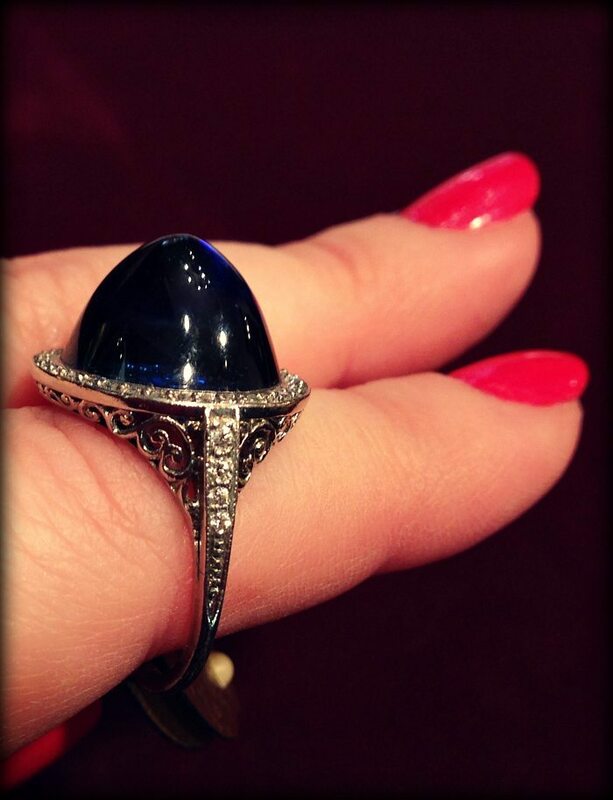 Sneak favorite: Edwardian cabochon sapphire and diamond ring. 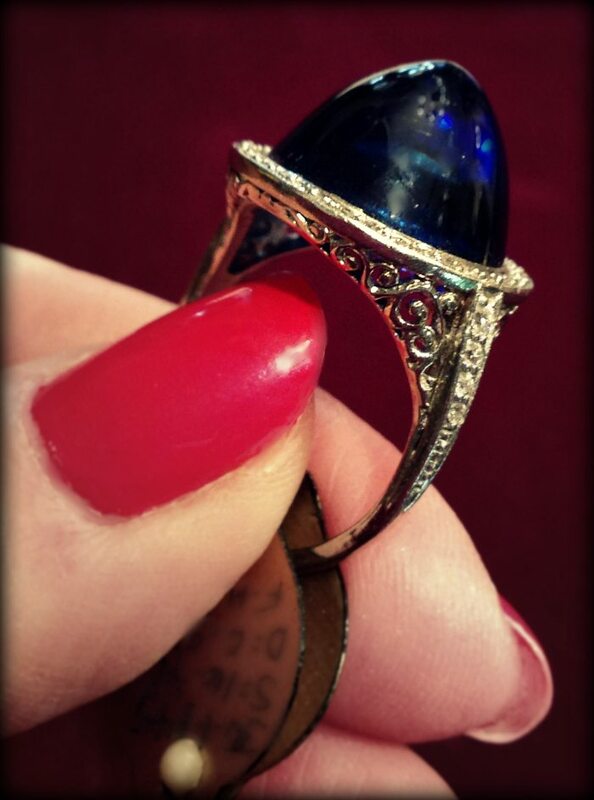 This Edwardian cabochon sapphire and diamond ring is one of the pretties that I tried on when I had the pleasure of visiting Lang Antiques a few months ago. I call it my sneak favorite because I wasn’t expecting to fall for this one, but it’s turned out to be one of the pieces I haven’t been able to get out of my head. I actually wasn’t even thinking about this ring, so I have to thank my fabulous and loyal reader, PepperReed, for suggesting that I try this on while I was there. Pepper, you officially have amazing taste in jewelry. Thank you for sharing your wisdom. That softly glowing blue center stone is a 16.40 carat sugarloaf cabochon sapphire of exceptional quality; almost entirely flawless. The exceptional gem is accentuated by the delicate filigree of the original Edwardian mounting, which is further adorned by a halo of old European diamonds. For a good, clean look, here’s an all-around look at this beauty from the gorgeous photos on Lang’s website. 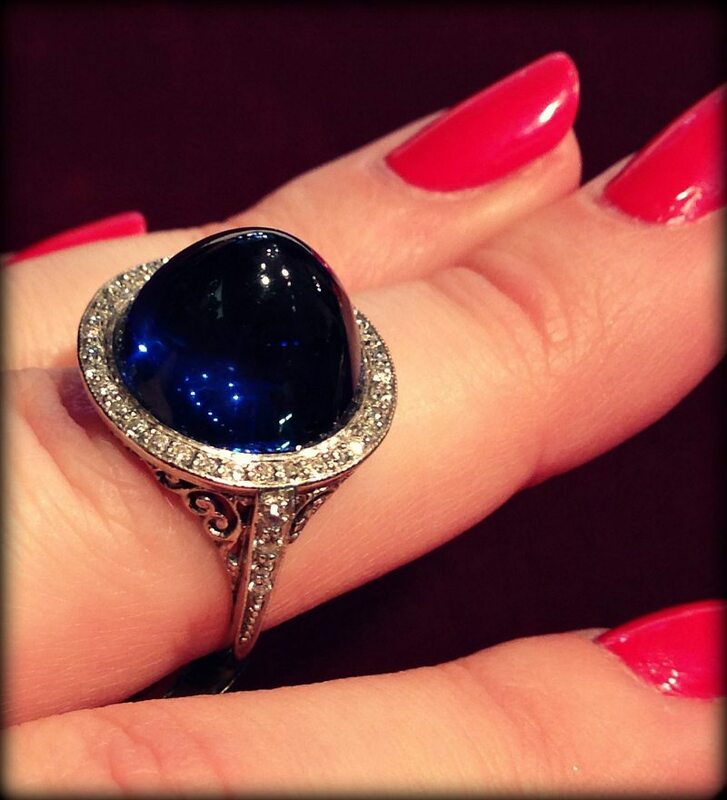 This beautiful cabochon sapphire and diamond ring is still for sale at Lang Antiques. (Only because I can’t afford it. Otherwise, it would be on my finger.) The photos in the collage are thanks to Lang, the rest are my own. Oh My Helen Keller!! <3 this So. Hard. and am very *jealous that you were able to try on this magnificent bauble. I just love sapphires and the incredible blue of this stone is just gorgeous. I don't care for most cabs because they're usually the sugarloaf cut (too pointy) but this chubby gem is bee*you*tee*full and I'm so glad you got to see it in person! It’s beautiful, isn’t it?? It’s for sale by Lang Antiques. Please contact them for more information. If you have any trouble reaching Lang, feel free to email me and I can connect you! My email is Becky@DiamondsintheLibrary.com.